Images from events in New Hampshire featuring reanactors, sports, and demonstrators set against a scenic New Hampshire backdrop. 2013 Black Ice Pond Hockey Tournament at Whites Park, Concord, New Hampshire. Chinook 100th Birthday Celebration January 13-15th, 2017 at Camp Cody in Freedom and Wonalancet, New Hampshire. A celebration of 70+ chinooks and their owners getting together for Chinook events including sledding, nosework, birthday cake, and the Wonalancet Chapel was open for viewing. Antler House and Wonalancet Farm are privately owned. Images from the 2012 NH Highland Games event held at Loon Mountain, Lincoln, New Hampshire. Images include the Scottish Heavy Athletics competitions, New England Disabled Sports, and the Scottish band competitions, and celtic rock bands. Hillsborough Living History Event, New Hampshire. Images of reenactments during the weekend events. Reanactors living in encampments during the Muster in the Mountains weekend held at the base of the Mount Washington Auto Road, New Hampshire. 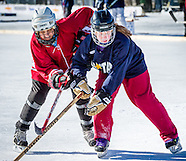 The New England Pond Hockey Classic tournament in Meredith, New Hampshire held February 2-3, 2013. Over 100 teams from around the US and Canada compete during the weekend event.